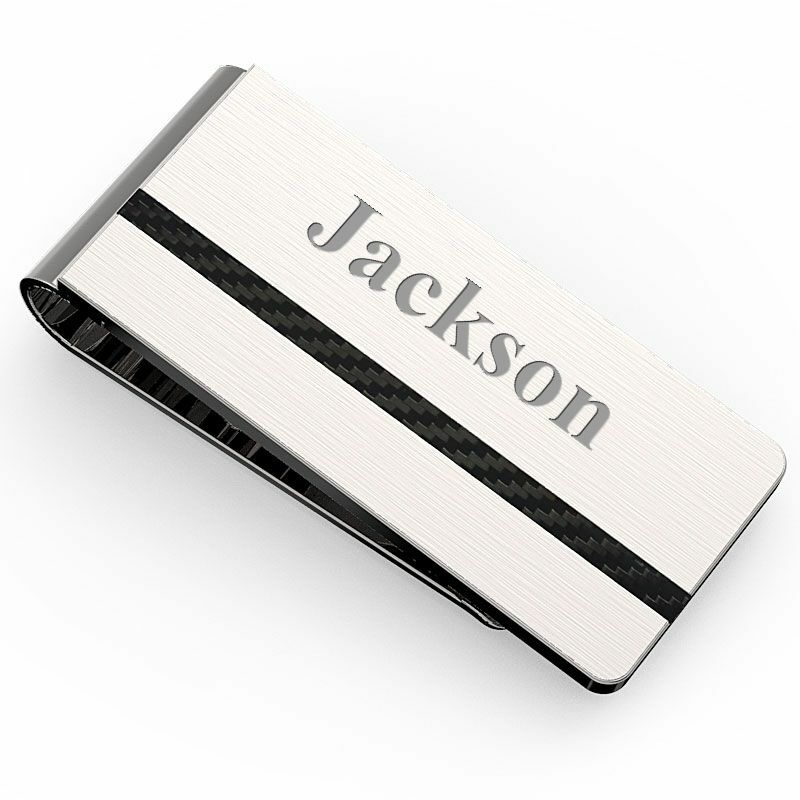 Contemporary and classic, this satin-finish solid stainless steel money clip will be a favorite for years to come! 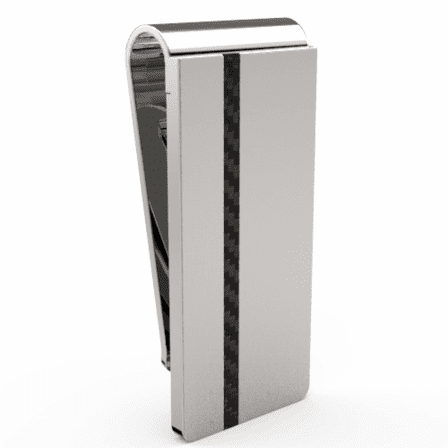 A great gift for family, groomsmen, graduation and corporate gifts, the sleek clip is accented with a black carbon fiber patterned stripe. The French-fold style holds up to 15 folded bills securely, and allows for easy access when removing cash. 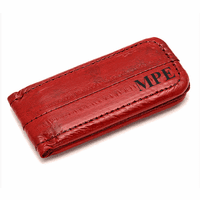 Add a custom touch with free personalization that he will be proud to display whenever he pays the bill! Dimensions: 2" x 3/4" x 1/4"
Do you offer any other fonts other than the ones listed, such as roman block or roman 4 line? We do have Roman 4 Line, just let us know in the comments section of our checkout page that you would like your engraving done in this font. I want to have initials engraved on this money clip, but I am wondering what a good size would be to select? It's hard to tell on the computer screen. A font size of 45 or 50 works great for initials. It makes them larger but still not so large that they overtake the whole money clip. When do you expect this back in stock? How long does it take then for least expensive delivery from order date to usual delivery in midwest? Can engraving be added to back, as well as initials on front? We should have this item back in stock within 4 to 5 weeks. We'll make it available to order as soon as its back in stock. Our first class mail shipping takes 3 to 4 days to arrive in the midwest, we're shipping from NY. The back cannot be engraved, sorry, there is no smooth area large enough on the back. 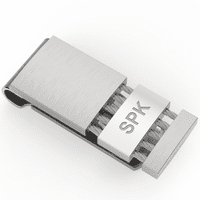 We can offer you free shipping plus a bulk discount of 5% off on this engraved money clip. Just choose either Priority Mail or UPS Ground as your shipping method for the free shipping and use the coupon code egscoupon105 in the gift certificate field of the checkout page for the 5% discount. On item SMC-037 or iem SMC-002B, can you engrave the initials on one line and have a small message line below? Sure, we'd have to make the engraving a little smaller but we could do it. Just specify in the comments section of the checkout page that you'd like a second line of engraving on your money clip and what you'd like engraved. Am I correct that this money clip does not have a spring on the back? That is correct, it has a folded grip back. I want to order the formal collection stainless steel money clip SMC-037 and have in engraved but was wondering where the initials would be placed? The engraving is done on the larger smooth, steel area. It is centered in this area. Could these money clips also securely hold credit cards? I'm looking for a combination money/card clip that can hold about 8 cards and cash. Thank you! Looks good but . . . This is smaller than I expected. Also, I have had it for a little over a year and it no longer has enough spring to hold less that about 8 to 10 bills. I'll be tossing this one and looking for one of higher quality. This one is a waste of money, certainly not worth $39. ConsIt is worn out in a little over a year. Don't waste your money on this. Although the overall quality is good and the engraving was done well, the size of this money clip is smaller than the many I have purchased over the years. It was disappointing in this regard. The Formal Engraved French Fold Money Clip was just perfect for the men on my shopping list. It excelled my expectations. The engraving was beautiful and proper size for the article.....Can't praise these enough...I ordered four and each person that received it was delighted. The packaging was top notch and presented well....Ordering was simple and staff most accommodating. I will certainly be ordering again from Executive Gift Shoppe for personal and business gifts. Great product.....Well done. It's a Christmas gift so I can't comment on the actual use of it, but it's certainly a nice piece of workmanship. Exactly what I had hoped for in quality and the engraving was perfect. An excellent money clip. Ordered the money clip for stylish teen grandson. He and I were both extremely happy with the quality. Having his first and second initial and last name engraved made a quality item look even more so This was my first purchase fro Executive Gift but it won't be my last. You get a good quality money clip that can be engraved for free! How can you beat that? This is a great value for the quality you're getting, and I love that you can personalize it. It's a little hard to slide money into it because it is so tight, but other than that the quality is perfect. Nice looking money clip. Prompt shipping. ProsVery nice money clip. Is exactly what I was looking for and product was as pictured. ConsWas a little disappointed as to the size and visibility of the engraving. The clip came with finger prints all over it. And the engraving preview digitally looked larger than it actually is. I can barely read whats written on the clip. Had I been able to tell exactly how tiny the engraving would be, I would have chosen a different font or smaller saying. Also, I can't get the clip to open, its very tough. Not sure if we got a defective piece. We shall see if my husband can get it to open and if he will like it when I give it to him for Xmas. Merchant Response:We're so sorry you're unhappy with the engraving. We do try to match up to the proof you approve when you enter the engraving. We'd be happy to ship you a new one with larger engraving. Just contact us here: http://www.executivegiftshoppe.com/contactus.html with your order # or email. I purchased this money clip for my husband who lost one that I had given him a few years ago. This one was beautiful, very sturdy, and the engraved initials made it very personal. 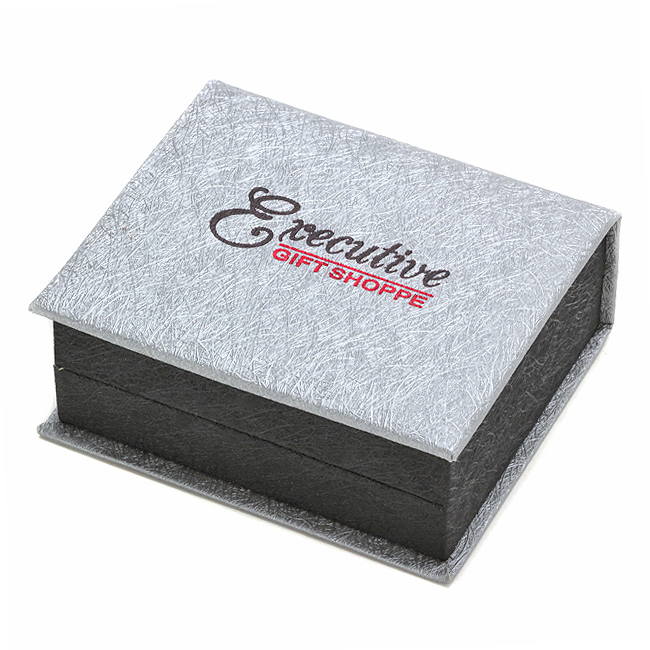 It was a quality product for the money and I would not hesitate to purchase other items from Executive Gift Shoppe. He loves it as it was just the design he prefers. ProsQuality product, nice engraving, reasonable price. Great money clip. The engraving turned out very nice and we received it fast. Definitely will order from Executive Gift Shoppe again. I was looking for a distinctive money clip and discovered this. Perfect, plus handsome engraving options, and all at a reasonable price. Speedy delivery, too. Definitely on my preferred vendor list now. This is a Christmas gift for my father, so I can't give it a complete review because it has not been used yet. It looks very nice and I like the inscription. I am pleased so far. Hopefully my father will really like it and it will be just what he needs. I received this money quickly. I had it engraved and it takes it up a notch. I am giving this to my son in law for his birthday, I am sure he will love it. The clip itself is excellent, Tight but, does accept 5 bills folded in half with little effort. Well constructed and good looking. The engraving is a different issue. I asked for my initials RGC 2, the RGC was quite good, but the 2 looks like it was done on a dot matrix printer, was smaller in size than the letters and was not on the same baseline (lower), almost like it was an after thought or maybe missed and had to be reset to amend. Merchant Response:We're so sorry, this has to do with the old english font. Numbers in the old english font come out looking a little different than a regular font. We'd be happy to redo this order for you in a different font free of charge. Would that work? If so, email us at help@executivegiftshoppe.com with your order # and/or the name the order was placed under. ProsExcellent clip, right size, grip, and good looking. Arrival time was excellent and product met expectations. Conswhen ordering on phone just make sure font size is mentioned because with all the stress of Christmas shopping, I forgot to mention and salesperson did as well which would have made it nicer ...still happy overall. I selected this money clip as a wedding gift for my husband. It blended nicely with a bracelet I gave him last Christmas. The clip itself is quite stylish and elegant. In addition, the service I received from the Executive Gift Shoppe regarding a special engraving request was above and beyond. I would recommend this product and this shop to anyone. 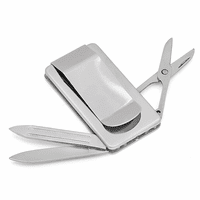 This money clip features has a simple and elegant design. The engraving is perfect and it was shipped to me within a few days. It will be a welcome Christmas gift for my husband. We're very pleased with this money clip. It's well made, easy to use and comfortable in your pocket. Very handsome too! Money clip is great, nice tight hold on bills. Free engraving was a great bonus. Looked wonderful, engraving was beautiful. Great birthday present for my boyfriend. He loved it. Excellent service and when I call,such considerate employees.I have seven grandsons and it is traditional that I give each one on graduation one of your engraved money clips and they love them! They tell me that each time they reach in their pockets that they remember their grandmother and it pleases me so! Thanks for helping with a family tradition. The inscription was perfect and the clip has an amazing quality to it. I am very happy with my purchase. This is a great company. Before I placed my order I had some concerns. My email was answered within 12 hours and all my concerns were addressed. The money clip was classy. The recipient loved it. I will use this company again. Very pleased with the quality, he loved it. Initials were nicely engraved,looks like it cost more. Arrived right on time. Will order from Executive again. The money clip arrived today and it is gorgeous. The initials were engraved perfectly, as well as the date that I requested. Very nice quality! This company is very professional and delivers on their promises. Thanks Much! Hubby loves his gift.